Mission Santa Clara de Asís was founded 12 January 1777 (8th in order) by Blessed Junípero Serra. The mission is named for Saint Claire of Assisi. The Indian name was Thamien. The original mission was moved many times due to flooding of the Guadalupe River. The third church was destroyed by earthquake in 1818. The fifth, and present, site began construction in 1822. In 1926 the mission church was again destroyed; this time by fire. 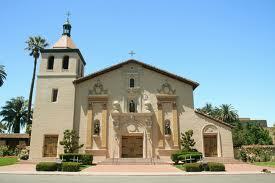 It was rebuilt in 1929 and now serves as the Santa Clara University chapel. The mission is just South of the San Jose airport. The address is 500 El Camino Real; located on the Santa Clara University campus. If Southbound on U.S. 101 exit at De la Cruz Blvd. and proceed South (keep to the right) until you reach El Camino Real (about 1.5 miles). Turn left to the mission (about half a mile). If Northbound on U.S. 101 you can proceed to De la Cruz Blvd as above or you can take Interstate 880 South for 2 miles to the El Camino Real (Highway 82) exit. Proceed to the right off the freeway to the mission (about a mile) (California Landmark 338).